KING COMPANY was formed in the early spring of 2014. Drummer Mirka “Leka” Rantanen (RASKASTA JOULUA, WARMEN, ex-THUNDERSTONE, ex-KOTIPELTO, etc.) had already been thinking about forming a new hard rock/melodic metal band for a long time. In this band he wanted to play with people with whom he had worked before and who he knew as both good musicians and friends. First, he contacted guitarist Antti Wirman (WARMEN) who immediately wanted to join the band. The singer Pasi Rantanen was in Mirka’s mind from the beginning, as they had played together in a couple of bands before (THUNDERSTONE, WARMEN). After keyboardist Jari Pailamo (KIUAS, PONIES TO KILL), and bassist Time Schleifer (ENFARCE) joined the band, this super-group was ready to start working. The band’s original name was “NO MAN’S LAND”. Bursting with enthusiasm the band started to work on their first songs and in the autumn of 2014 they entered the famous ASTIA STUDIO to record their first 3 song demo. Shortly after Antti Wirman got a temporary gig as the touring guitarist of CHILDRENS OF BODOM, which limited their rehearsal time, but still the band managed to write more and more songs. They started co-operation with Heta Hyttinen & GINGER WINE MANAGEMENT which eventually got them a recording contract with FRONTIERS RECORDS. This was the band’s dream come true, and the debut album recordings could begin. In the autumn of 2015 the band played two very succesful gigs in Helsinki and Jyvaskyla. The nearly sold out venue “ON THE ROCKS” witnessed the band’s first live performance as they played a set full of songs from the upcoming album. Immediately after these gigs began the debut album recordings and the album was mastered in January 2016. The album recording and mixing was done by Janne Wirman and Kal Kaercher and mastered by Mika Jussila. At this point FRONTIERS RECORDS suggested that the name of the band should be changed because there already were two other bands with the same name and there was a risk of confusion. 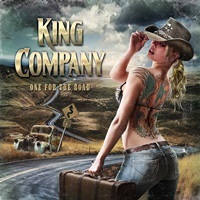 The band changed its name to “KING COMPANY”. The album release date is in early autumn 2016, and after that the band performs at least in Finland and later in the rest of the world. The debut album is called “ONE FOR THE ROAD”.